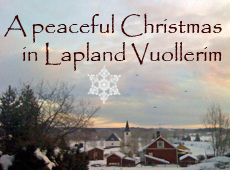 Come and celebrate an authentic Swedish Christmas in Vuollerim, Lapland, near the Arctic Circle! Experience a Christmas in white! Get around the village using a kick sleigh, try skiing, snowboarding or drive a snowmobile. You can also just relax and enjoy genuine everyday experiences in this winter land of snow, reindeer, the Blue and Northern Lights! This package offers a variety of experiences for many tastes, and ages whether you come in a group or alone. Here is the place to experience genuine activities in the warmth of friendly welcoming villagers. And be part of preparing an old fashioned holiday celebration. Lapland is near! Flight time is approximately 1.15 minutes from Arlanda airport in Stockholm to Kallax, Luleå. From there, only 1.5 hours drive to Vuollerim. In Vuollerim, the big and small Lule River comes together and flows into one of the largest rivers In Sweden. This River has characterized the district since time immemorial. People have come together and lived here for over 6000 years. The game-rich forests and fish-filled rivers have offered plenty of food. This and much more is the basis for the well-known “Vuollerim spirit”- warm and open people. Here you will meet not a tourist resort – you meet a village! You will stay at Hotel Vuollerim Gästgiveriet, in the heart of Vuollerim, where each hotel room has been decorated by various villagers. Additional activities may be available by request – please let us know what your interests are. Guest are welcome to participate in the Christmas preparations which include choices such as decorating the Christmas tree, or joining villagers in making Christmas candy. Rimstuga. A tradition where people get together and write rhymes for their Christmas gifts. Story telling with Tomten Tomas, our local Santa. Four nights’ accommodation with breakfast, two 2-course dinners at the hotel, a Christmas Buffet with villagers, a house hopping dinner at the homes of villagers 3 – course dinner in three different houses, an evening with “ Glögg”, mulled wine, Christmas preparations, Christmas lunch with Christmas porridge and ham, Christmas crafts workshop, story telling at Tomten Tomas, Story telling at the homestead, two “Fika” (Swedish coffee break). We can organize transfer to/from Airport and train station. The price is for a double room with toilet. Shower is located in each level. Optional room with both toilet and shower + 250 SEK each night.